Great Dacia Duster van Leasing & Contract Hire Deals. Dacia's Duster looks set to bring something new to the LCV market with a combination of affordable pricing, decent space and the option of 4WD. The normal Duster has proved popular with over 16,000 sold in a little over 2 years, so will this commercial variant prove as much of a hit? 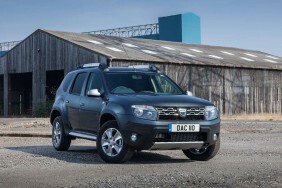 Our Dacia Duster Lease Deals. Dacia have stunned many a rival car manufacturer, becoming the fastest-growing automotive brand since their re-launch under Renault back in 2004. Their no-nonsense approach makes sense for passenger vehicles and arguably even more so for LCVs. The Duster offers distinctive styling, a low purchase price and, with the 4WD models, true off-road ability. This is a combination no other new LCV can match which makes it easy to overlook some of the Duster's downsides. Even if you don't need off-road ability, the Duster is well worth a look. If you do, then it may be your only option. The competition should be worried. Dacia's parent company Renault is no stranger to the commercial vehicle market, offering anything from small vans like the Kangoo right up to big trucks. This is important as the Duster is based on a stretched version of the B-Zero platform that underpins the Renault Clio and also the Nissan NV200. This re-using and refreshing of older components allows the Duster Commercial to come in at under £10,000 for the basic 2WD version. With 30% of the LCV market in the UK consisting of car-based vans, Dacia UK & Ireland specifically requested the creation of the Duster Commercial. With production of the Duster shifting to Dacia's Romanian plant in Pitesti, it proved the ideal time to offer a factory-made van, as opposed to a local conversion of the passenger vehicle. With no other new van offering this level of off-road capability for the money, Dacia could do very well with the Duster. In these days of minimal body roll, quiet diesels and tight body control, the Duster is a bit of a throwback - but in a good way. Overall comfort is excellent with the softly sprung suspension able to cope with bumpy roads and trips off-road with ease. The downside to this is a fair bit of body roll under hard cornering and dive under heavy braking. Considering most operators will be at least slightly concerned with the cargo in the back, it's unlikely this will cause an issue. The noise from the 1.5-litre diesel engine may be of more concern, although you can easily forgive the Duster here. To get the price as low as this, some corners have to be cut. In this case, it seems sound deadening was a little too expensive. There's no doubting the diesel's effectiveness though. The power output is 110PS, while torque is a thumping 177 Ib/ft. A tight 10.44m turning circle will mean the Duster is manoeuvrable, while the optional 4WD really does make this a very capable vehicle. There are 3 settings on this drivetrain: '2WD' which powers the front end only, 'AUTO' which shuffles torque about automatically and 'LOCK' which splits torque 50/50 front to rear at speeds of up to 50mph. The last option is really only for slippery surfaces but is very effective when things get tricky. Sure, it's not unstoppable but it's a lot more capable than anything else at this price point, save for a secondhand 4x4. Externally there's no doubting the Duster is a bit of a looker. Up front there's a restyled nose on this model, with a smart chrome grille to go with the chunky skid plate and updated headlights. Big blistered arches cover attractive alloy wheels on the top model and there are tough steel items on the base trim: either way, a fair bit of muscle is added to the shape. You still get rear doors like you would on a much pricier Land Rover Discovery Commercial model, with the rear glass blacked out to hide what's in the back. Inside, the Duster's cabin has been improved over the interior originally served up on earlier car versions, thanks to smarter trim and fabrics. Plastics are still on the hard side without some of the nicer soft touch stuff operators of pricier vans might be used to, but again, concessions had to be made to get the asking figure this low. The dash looks smart enough though and certainly has plenty of cubby holes and storage for all the things you may need on a day to day basis. There's also 12v and USB sockets to charge your electronic devices on the go, handy if you're stuck in the middle of a forest somewhere. Behind the front seats is a flat load area with anchor points and a decent 1,150-litres of capacity for the 4x2 and slightly lower 1,000-litres for the 4x4 due to the more complex rear suspension. The cargo deck has a length of 1.4 meters, with in excess of a meter between the rear wheel arches. Maximum payload is 550kg for both the 2WD and 4WD models, leaving you with slightly more space than a Corsavan but not able to carry as much weight. As to be expected with the raised ride height, the load bay is quite high. Dacia like to make things as simple as possible and their model structure is no different. There's one engine, two trim levels and the option of 4WD for just under £2,000. Entry-level Ambiance trim includes electric front windows, a height-adjustable steering wheel and driver's seat, luggage area lighting, a four-speaker radio/CD player with MP3 compatibility, Bluetooth, AUX and USB sockets. Spend another £1,000 or so and the top spec Laureate models gain alloy wheels, satin chrome roof bars, side sills and scuff plates, a seven-function trip computer, heated and electrically adjustable door mirrors, cruise control with speed limiter and air conditioning. For less than £500, you can get a touchscreen sat-nav infotainment system, a bit of a bargain. To keep you safe, all models get ABS with emergency brake assist, electronic stability control, traction control and 4 airbags. While you could compare the Duster Commercial to other car-based vans, nothing else that's new can offer 4WD (or arguably this level of style) for so little money. The rear doors should make loading and unloading easier too.